DEET products are too toxic and should never be used, especially around children and more especially on their skin. What is effective, non-toxic and recommended is explained below. Some have also recommended Watkins Vanilla hand/body lotion, which is available at Walmart. 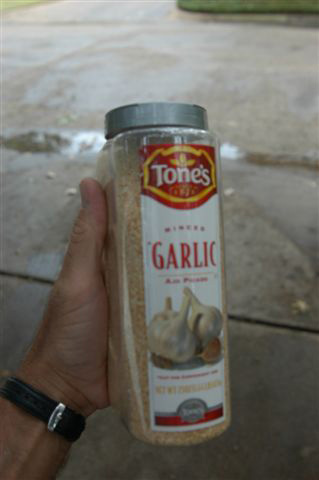 Spray garlic tea over the entire problem area and for even more control broadcast dry minced garlic at 2 - 5 lbs per 1000 sq ft. Reader Comment: Your tip about dried minced garlic is the first thing that has worked for my TERRIBLE mosquito problem in my small backyard. By the way, I found a 23-oz container at Sam's Club for $3.85. I'm going back to stock up. THANK YOU !!!!! Answer: Gambusia is an effective part of a natural mosquito control program. Most of the garden centers that sell ponds and aquatic plants also sell these fish. Picaridin: More pleasant to the skin and doesn't have the odor that DEET repellents have. (It's a chemical so still not on my recommended list). Oil of lemon eucalyptus: A natural ingredient for those who don't like the thought of putting chemicals on their skin.